This is Holy Week in the Christian calendar. Today is Maudy Thursday, and tomorrow is Good Friday. 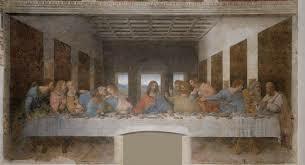 It seems an appropriate time to talk about Leonardo Da Vinci’s fresco, The Last Supper. Here are some surprising things I learned about The Last Supper when The Art Caravan visited Milan and had a look…..
*It’s painted on the (former) refectory wall of Santa Maria delle Grazie, a 15th century church and Dominican convent. Yes! That’s the top of a doorframe butting into the tablecloth under the centre figure of Jesus. *Leonardo da Vinci used an experimental technique to paint the fresco, and it started deteriorating twenty years after its completion. *The colours are muted; most reproductions don’t reflect the deterioration of the work. *Santa Maria delle Grazie is beautiful, too, and worth a visit. It’s a UNESCO World Heritage Site. When you plan to visit Milan and see The Last Supper (of course you will!) you MUST have reservations. You can (theoretically) purchase tickets on-line, but the website (the last time I tried) didn’t work all that well. It’s better to pay for a walking tour that guarantees your admission. This entry was posted in Leonardo da Vinci, Milan, Rick Steves, Santa Maria delle Grazie, The Last Supper and tagged Leonardo da Vinci, Milan, Rick Steves, Santa Maria delle Grazie, The Last Supper on March 24, 2016 by terryvatrt.